OSHUNwhite works by removing bacteria in the mouth, which are "pulled" out with the oil. This is proven to naturally whiten teeth, reduce plaque and will leave you feeling fresh and clean for hours. We suggest using one OSHUNwhite sachet per day at your preferred time, whether as part of your morning or evening routine, after a meal or before a special date. OSHUNwhite is also non-abrasive, has no side effects and avoids the need to use bleach or lasers. 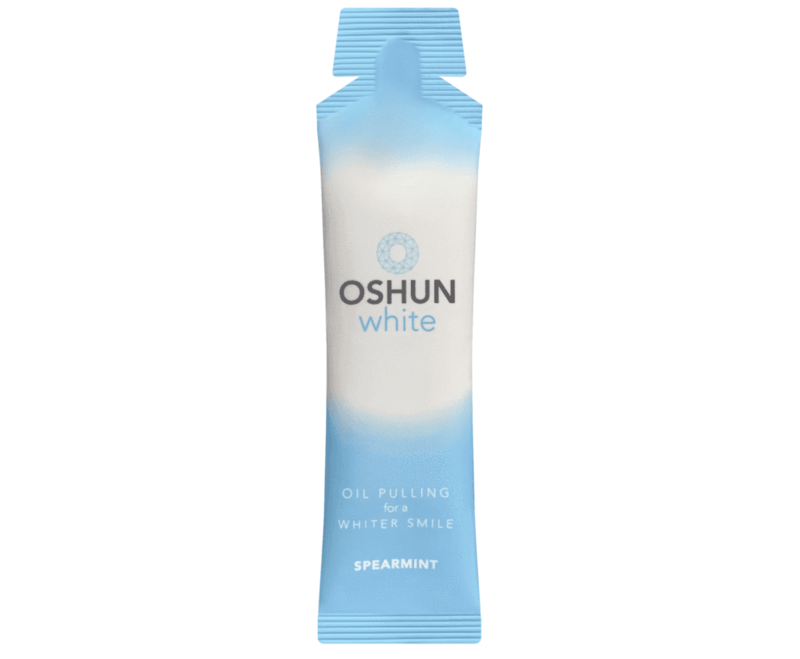 Each box of OSHUNwhite contains a two week supply of 14 convenient 10ml sachets. We suggest using one sachet per day or whenever you want to freshen up. Whitens teeth, reduces plaque and leaves a fresh feeling. Non-abrasive and no side effects. 14 sachets in each box. Secondly, I feel like everything that the brand promises has come true. I can feel my teeth being a lot cleaner and my mouth feels much fresher after I use this product. I am also happy with the fact that bacteria is removed using natural products. Lastly, the price is on point. You pay £20 for 14 sachets with free shipping. Plus with every order you get a copper tongue cleaner. However, there are a few cons to this product. First is the taste. When I ordered the Spearmint sachets, I was expecting the minty taste to be intense... like chewing gum intensity. But what I got was a faint spearmint taste. Maybe, the other tastes like the Wild Cherry are better. I would love to try out this one. Lastly, the sensation of squeezing out the product into your mouth is something else. I can't describe it... I absolutely despise that feeling. I would rather have the oil be squeezed onto my toothbrush and use it that way. So to conclude, I would recommend this product. There obviously is room for improvement, but for what it is and what it does, the product is worth the money. Plus, it's not that expensive anyways. As you can see in the before and after above, the Whitening Oil did whiten my teeth! You can get your OSHUNwhite sachets using my affiliate link HERE. However, if you are quick options, you can read a Teeth Whitetning Review conducted by Reviews.com where they research and review teeth whitening products that contain Hydrogen Peroxide or Carbamide Peroxide in them. Those will obviously whiten your teeth much quicker but is not a natural option like the OSHUNwhite Oil sachets. Your blogs all read like student assignments. Let loose a bit more and show your personality through your words.